Tuomas Ollila-Hannikainen is currently Artistic Director of Finland's period instrument orchestra, The Sixth Floor Orchestra (since 2005). He has been amongst the brightest prospects in the extraordinary wave of younger Finnish conductors since being appointed Chief Conductor and Music Director of the Tampere Philharmonic Orchestra in 1994 (until 1998). 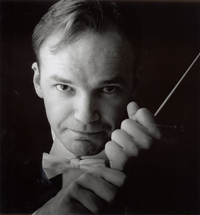 He has also held positions as Joint Principal Conductor of the Tapiola Sinfonietta in Finland (1999-2001) and as Principal Guest Conductor of the West Australian Symphony Orchestra (2001-2003). Today he regularly conducts many of the most prestigious orchestras throughout the Nordic countries. Elsewhere his work has taken him to Europe, Australasia, N. America and the Far East with orchestras like the St. Petersburg Philharmonic, Netherlands Radio Philharmonic, Frankfurt Radio Symphony, National Orchestra of Spain, BBC Scottish Symphony, Ulster Orchestra, Sydney Symphony, Melbourne Symphony, New Zealand Symphony, Calgary Philharmonic, Singapore Symphony and Malaysian Philharmonic amongst many others. Tuomas Ollila-Hannikainen's formidable talent is also reflected in the numerous CD recordings he has made. His recording of Sibelius's Complete Karelia Music with the Tampere Philharmonic Orchestra (ODE 913-2) won a Cannes Classical Award and a Finnish IFPI’s Janne Award in 1999 and was chosen as UK Sibelius Society's Record of the Year in 1998. Further recordings on Ondine include orchestral music by Uuno Klami (ODE 854-2, ODE 858-2), Aarre Merikanto (ODE 905-2, ODE 915-2), Leo Brouwer (ODE 979-2) and more Sibelius (ODE 871-2, ODE 952-2).